message for people with sensitive skin. NOw you can rest easy we have you covered. It was a skin condition that prompted the company founder, Sarah Brown, to develop a skincare line that would address hypersensitivity. Brown was diagnosed with chronic urticaria: a condition that produces large red welts, making the surface skin area very sensitive to topical creams, fragrances, and oils. But Pai is not only for the uber-sensitive skin; it’s also effective for all skin types. The fabulously lush, pure organic line leaves every skin type user feeling like they had a spa day, in their own home. Lightly scented with a choice of camellia, rose, orange, rosemary, jasmine and basil, and plenty of Omega-6, Omega-9 and Vitamin E. Pai skincare products have a nurturing effect, as they replenish the dermis with plant nutrients that balance, tone, and create a natural glow. Interestingly the word ‘pai’ is a Maori word meaning goodness, which is the basis of the Pai philosophy, as Brown mentions on her site. In fact, Brown has created much more than a good brand; Pai is completely rooted in the details, harnessing purity, holistic health, and sustainability. Apart from the obvious negation of unsavory chemicals such as parabens, alcohol, phenoxyethanol, petrochemicals, detergents (SLS/SLES), and artificial fragrances, the company’s ethos is complete transparency. Visit their website for more juicy information about their philosophy, and watch Sarah Brown’s video story of her journey as the founder of Pai. 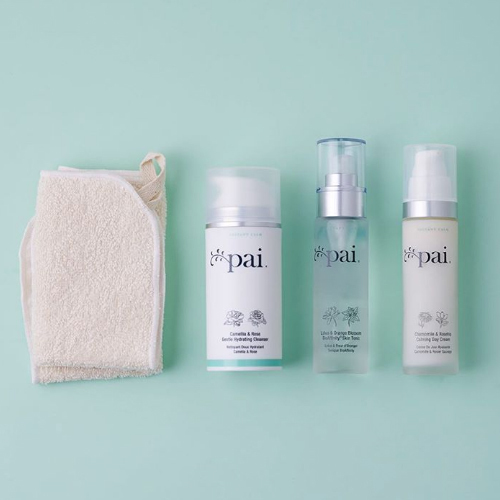 But even better, try any of the Pai products, you cannot go wrong with this beauty line created from organic ingredients that’s focus is on treating your skin with the utmost delicacy.